START THE JOURNEY TOWARDS RECOVERY! Well, dogs have been used professionally for their therapeutic qualities for many years. Programs which see dogs being taken to old people’s homes and children’s wards are now common place, but more lately their therapeutic powers have been extended to those overcoming the disease of alcohol and drug addiction. 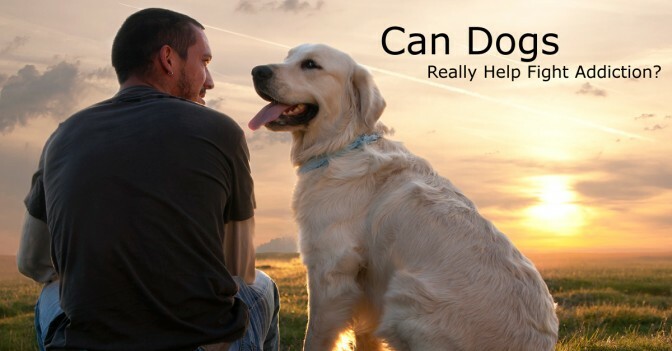 While there is still much study that needs to be conducted, here is a short overview of the positive impacts which pets can help to the addiction recovery process of alcohol or drug addiction. Many studies and research have been conducted which clearly show that pet ownership or the time spent with animals can help lessen depression, stress and anxiety – so much so that associations have been made between lower blood pressure and animals. Stress can be trigger both for the start of addiction relapse. People who are struggling alcohol and drug addiction have had their sense of empathy eroded by years of self-centered behavior. It is easier to build relationship with animals with human. They make no judgments; no questions are asked and can therefore help to regain an addict’s emotional connection with individuals around them. Reinstating responsibility back into lives is a key component of the step to recovery. Taking good care of an animal is a best way to try and build the sense of responsibility back up. Dogs are too a big extent, totally reliant upon their owners for their well-being and their love approach to those humans helps to create that sense of responsibility. People who are suffering from alcohol and drug addiction, have hit the rock bottom of addiction in means of how they figuring about themselves. Not only their families, friends and the community as a whole given up on them, they have also given up on themselves. Dogs make no judgments so they can assist in reclaiming this sense of self-worth. Seeing that there actions by simply wagging their tile and even the act of stroking a dog can cause such happiness and can be a big step on the road to addiction recovery. There are some recovery center programs that allow patients bring their own pets in with them and researches have indicated that this helps extremely with the addiction recovery process. Permitting pets to live with their owners sustains a full host of additional administrative and practical costs; so many centers are hesitant to introduce it. But, the success of some centers which have is probably to be recreated in many coming years. For some addicts, the simple joy that dogs contributed helps a lot for the fast addiction recovery process. The individual can automatically lifter their spirits. The ability of dogs to create happiness and apparently out of thin air should never be underrated. Many addiction treatment centers are starting to encourage people to get a pet while they work to overcome their addiction. Hi! Yes, an increasing number of rehab centers are now implementing pet therapy as part of their comprehensive treatment because this kind of therapy gives substance abuse patients a companion as well as teaching them a sense of responsibility. Haven’t seen any studies about using dogs for addiction recovery but it makes sense because it gives people a sense of purpose which is important for getting back on track. Equine Therapy is popular but not as convenient for many people. Interesting topic. Hello there Jeff! Thank you for getting interested in my blog. I agree with you that Equine therapy is more common when it comes to animal-assisted therapy, but I’m certain that the usage of these two animals is just the same when it comes to the addiction recovery process. Can Dogs Really Help Fight Addiction? My Parent is an Alcoholic: What do I do?